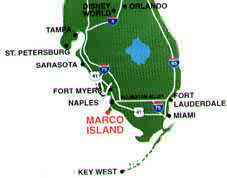 Our Marco Island rentals are located 16 miles South of Naples, FL and 50 minutes South of Ft. Myers, FL on the largest island of the Florida Everglades' 10000 Island chain. Also about 40 miles south of Sanibel and Captiva Islands. Marco Island is known for spectular white sand beaches which, fishing, and sunny weather. These beaches are beautiful for relaxing and kids vacations. Marco Island is 4 miles by 6 miles and contains all of the restaurants,shopping, you will need right on the island itself. Public access to the 4 mile long crescent shaped beach is just 2 miles from our house. The question is, "What are the 3 most important factors to consider when choosing a Marco Island villa?" As you drive onto the island via the Jolley Bridge, you'll take a left turn on to North Barfield Dr.. By this time you have noticed what a beautiful island it is. If you have been to other beach front communities you would see billboards exhorting your kids to spend money at go-carts, wax museums, and other tourist traps. Not on Marco Island! This is a community which maintains its tropical roots. Next you take a right turn on to Birwood Terrace, and you can't help but say "WOW!". 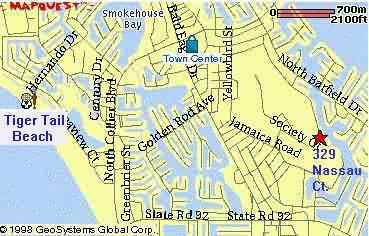 The Island Country Club clubhouse is stately and elegant and provides an appropriate introduction to Nassau Ct. Far down the palm lined cul-du-sac, a few houses from the end, on the left you find 329 Nassau Ct. You notice right away the privacy of this neighborhood. Sure, if our neighbors, are out on their bikes , they are going to wave and greet you, but this is one quiet neighborhood. You now know that you have left the condo and office buildings behind. The only sound you hear is the occasional golf cart visible at the end of the cul-du-sac which opens to the golf course. You turn into the driveway leading to the double garage, stop the car and run to the front door. Step in the door and your eyes are grabbed by the waterview through the wide patio doors. Past the patio, over the large, heated pool, and private dock, all you can see is water! All you can think about now is relaxing in a lounge chair. Meanwhile your kids are hopping into the pool and you can relax because the pool is visible from the patio, master bedroom, living room, and kitchen. 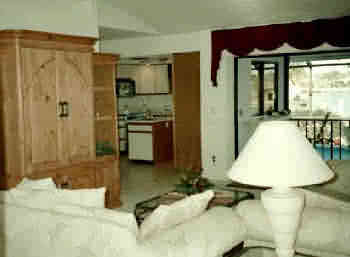 Rent a Marco Island condo or rent a house? No parking lots or garages! No hunting for a parking space or having to remember where you parked the car! Yes, you can invite friends over for a private pool party. The pool doesn't close unless you want it to. Yes, you can hang around the pool after you put the kids down for a nap. Satellite picture of the water-view behind our house. Looking for fun on Marco Island?